Hello ♡ This is probably my longest hiatus of blogging ever! I just finished my marching band season at our state marching competition. I was really nervous because all the bands before us were getting twos, but fortunately we got a one. After that fiasco we when to a mall which was about twenty minutes from the competition site. Let me just take a few seconds to say this mall was amazing. It was huge and had way better store than I have in my local mall. One of which was LUSH! I was really excited because I really wanted to try a bath bomb because it fizzes and sounds like the most luxurious thing some basic person can have. They were a bit expensive, but I don't take baths all the time and I thought this would just make it better. Since it was my first time, I bought three because I don't have a lush near me at all. This bath bomb is pretty tiny comparing to half the size of the Sakura bath bomb. It is sweet and at the same time it is very fresh. I like that is tiny because I feel like I am not wasting as much and I get to get a feel on how it works. This bath bomb is different from the picture above to the one one the Lush website. It comes off as blueish-green with faint white spots, but the one I have looks like a dinosaur egg. It is a mint green with yellow and pink spots including really faint white spots. It is the most fragrant and it overpowers all the other bath bomb smells. This has to my favorite one because I am a big fan of Sakura. Not Sakura from Naruto, but the trees and Sakura the Cardcaptor. It is fragrant, but light at the same time. It has little blue crystals for exfoliation, I think? It would great in the winter when I am really missing spring. I have not done a haul in a while, but I thought this was a fun one. I will try posting more often and I will try to do either a party planning or skincare routine. Please follow me on Twitter and Instagram because I post begging to post frequently on there. Another side note is that I deactivated my Facebook because I never post on there and not a lot of people go on there anymore. Well that is it for now, so peace out girl scouts! What is your favorite product from Lush? I love these fizzy bath bombs! They are my favorite products from Lush and I love getting into a nice relaxing bath with the jets turned on after a long week. Nice haul. Thanks for the comment, Erica<3 I am looking forward to my bath!! Oooh I love your new layout! Fizzbanger is my favorite LUSH bath bomb, it smells absolutely divine! Although I don't really think it smells that much like apple pie. 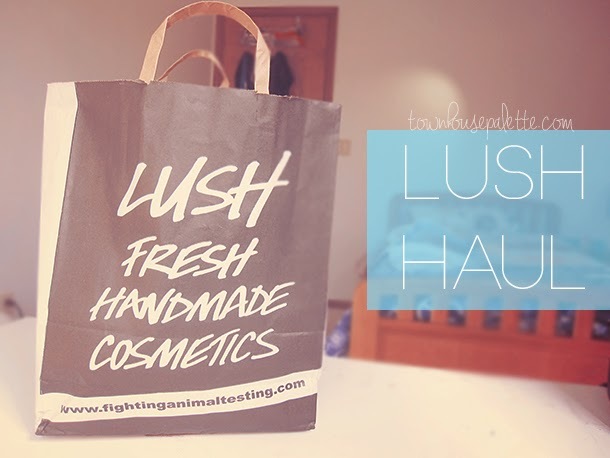 aaaaa i ever want a lush product! we dont have it here! and we dont have bath tubs here... -_- but i still want to get the bath bombs! I have tried the Twilight bath bomb and it smells amazing! If you cut it, or break it off into different pieces like I did, it will last a long time! Love the haul! lovely haul...i love bath bombs!